The Hopseed is found throughout Arizona. It is a slow-growing evergreen shrub that can grow 12 – 15 ft. tall with an equal width. It blooms greenish yellow flowers in spring and fall. 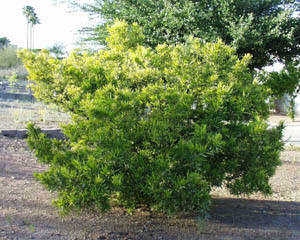 The Green Hopseed Bush is an ideal xeriscape plant in Phoenix. It can be grown as an informal hedge or a patio tree. Other Features: Oleander alternative. Decorative papery fruits attract birds. Also try D. viscosa v. purpurea, which has bronze-purple leaves.